Happy Veteran's Day! If you have read my "about" section, you know The Polka Dot Store.com is run out of my home. Running The Polka Dot Store out of my home gives me flexible hours and more time to be creative. I love my life and where I live. Today, I would like to start a series of posts sharing with you the unique things about the town I live in. Welcome to Thomasville, Georgia! So, where is Thomasville, GA? 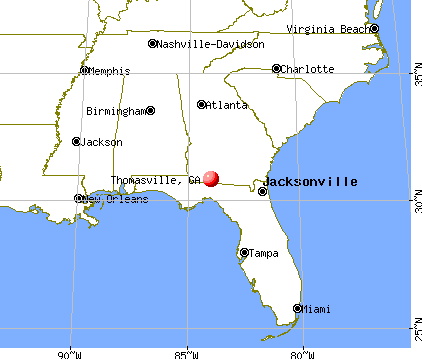 As you can see from the map, Thomasville is located in southwest Georgia about 10 miles from the Florida state line. The closest cities to us are Tallahassee, Florida, Valdosta, Georgia, and Albany, Georgia.
. The streets downtown are blocked off and there is a parade, dance, arts & crafts, flower show, etc. Hug a veteran today and tell them how much you appreciate their service!